Where do I find the National Core Arts Standards? The standards are available at www.nationalartsstandards.org and at each professional arts education association website. Why are arts standards important? 1. The arts are core subject areas. Education experts and policymakers consistently identify the arts as core subjects – i.e., subjects that all students need to study. Every school has a responsibility to ensure that all of its students master a core curriculum that includes the arts. 2. Arts standards identify what is important for students to know and be able to do in the artistic disciplines of dance, media arts, music, theatre and visual arts. Practicing arts educators wrote the standards, with input from researchers and professional artists. This blend of classroom-based wisdom and scientific method enabled writers to craft challenging but developmentally appropriate standards for students at each grade and level. 3. Arts standards identify pathways for students to become creative thinkers, creative makers and creative responders to the world around them. As corporate leaders and policymakers demand a more creative and effective workforce, new arts standards define processes that cultivate our students’ problem-solving skills for success in career, college, and life. 4. Arts standards emphasize the collaborative nature of artistic production. Teaching the Core Arts Standards develops collaboration and communication – key components of the 21st Century skill set desired by employers and higher education. 5. Arts standards reaffirm the importance of a comprehensive education that extends beyond reading and math. While federal and state education policy supports a broad definition of education that includes the arts, narrow accountability systems too often shrink the scope of children’s education to “basics.” Arts standards support the comprehensive education that students need for a successful life and career. Why new arts standards? Since their initial publication in 1994, our nation’s first standards for arts education have guided improvements in the design, delivery, and assessment of arts education. Recent surveys of states and other nations reveal that education policy priorities as well as arts educators’ instructional resources and practices have evolved significantly during the past two decades. The new arts standards are designed to help arts educators provide the high-quality curriculum, instruction, and assessment that students need to succeed in today’s schools and tomorrow’s careers. How do the 2014 standards improve upon the 1994 national arts standards? 1. The 2014 standards provide grade-by-grade performance standards from PreK– 8th Grade, and three levels for High School. Providing grade-by-grade standards addresses requests from several state education agencies while also mirroring best practice in other academic areas. New arts standards outline an age-appropriate developmental progression of artistic study that provides a state-of-the-art foundation for curriculum, instruction and assessment. The three levels of high school standards – proficient, accomplished, and advanced – acknowledge the range of skills and knowledge that students possess as they begin their secondary school years. The new arts standards call for all students to achieve at least the proficient level, and preferably the accomplished level, in at least one arts discipline by the end of their PreK-12 schooling. 2. The 2014 standards provide greater structural and content alignment among the arts forms than the 1994 standards. The Philosophical Foundations and Lifelong Goals presented in the Conceptual Framework for the 2014 arts standards emphasize developing Artistic Literacy in all five art forms, by empowering students to independently carry out four shared Artistic Processes: Creating, Performing/Producing/Presenting, Responding, and Connecting. These processes are articulated in eleven Anchor Standards that are also common across art forms. 3. The 2014 standards include a fifth artistic discipline: dance, MEDIA ARTS, music, theatre and visual arts. The addition of media arts standards reflects a broadened definition of arts-making that includes contemporary forms such as animation, film, gaming or interactive- and computer-based art-making. Media arts standards already exist in two states (Minnesota and South Carolina) as well as two large, urban districts (New York City and Los Angeles Unified). 4. The 2014 standards acknowledge the essential role of technology, both in their definitions of the arts forms and in how the standards are presented. The National Core Arts Standards incorporate technology in how each art form is practiced and taught, reflecting the growth and transformative influence of technology in art-making since 1994. Teachers, students, parents, and administrators who access the standards via the web at www.nationalartsstandards.org can customize their own experience, identifying or downloading materials most relevant to their needs. 5. The 2014 Standards provide a variety of materials to support implementation, including Model Cornerstone Assessments. To help educators implement the new standards, writing teams developed supplemental materials – including Model Cornerstone Assessments (MCAs) and glossaries of key terms – for simultaneous release with the standards. Draft MCAs embedded in the standards site provide tools teachers can adapt to document student growth and outcomes aligned with the new arts standards. These assessment tools will be piloted in classrooms across the U.S. and revised by teachers in future years, eventually generating student work that will be posted on the NCAS website as “benchmarks” to illustrate the expectations of the standards. Teachers may adopt, adapt, or create their own MCAs as appropriate for their particular students and classrooms. Who wrote the 2014 standards? A broad coalition of arts education associations partnered with leadership organizations in the arts and education to develop these standards. The more than 100 experts from 30 states who crafted and revised draft standards were selected for writing teams based on their broad range of teaching experience – collectively representing every level from early childhood through higher education – as well as demonstrated expertise in curriculum and assessment. Researchers from each arts discipline and the College Board reviewed child development research and best practices in arts education from across the U.S. and internationally. Successive standards drafts were posted for public review twice in 2013 and again in 2014; as a result of the public review process and series of focus groups sponsored by various organizations, more than 6,000 individuals provided comments and suggestions that informed the final standards. 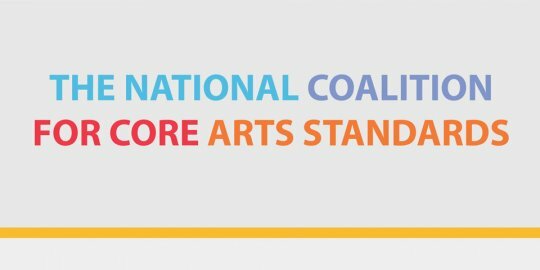 The larger arts community has been part of the standards development process since early meetings of the Coalition. The National Endowment for the Arts supported professional artists’ participation in the standards revision process. The National Guild for Community Arts Education, Young Audiences and Americans for the Arts facilitated input from artist focus groups during the review and revision process. Each public call for review included teaching artists as well as arts and cultural organization leaders. How were the National Core Arts Standards funded? All arts standards writers were volunteers. The majority of technical support and resources for NCCAS work has been provided by coalition partner organizations and by state agencies that participate in the State Education Agency Directors of Arts Education (SEADAE). The National Endowment for the Arts awarded SEADAE a project grant of $30,000 in matching funds to enable professional artists to participate in the review and revision process. How are the new standards organized? The Core Arts Standards include two levels of standards: Anchor Standards and Performance Standards. Anchor Standards are overarching standards statements of what students should know and do in all of the arts as a result of their PreK-12 education. A performance standard is a statement of what students should know and be able to do in a particular artistic discipline by the end of a specific grade or level. Where can I find more information about key ideas in the new standards such as Artistic Literacy, Enduring Understandings, Essential Questions, and Key Traits? Individuals who seek a deeper understanding of key ideas and terminology in the new arts standards, as well as the rationale behind those ideas, should refer to the Conceptual Framework. What is the relationship of the arts standards to Common Core? The National Core Arts Standards focus on dance, media arts, music, theatre and visual arts; the Common Core State Standards (CCSS) focus on English/Language Arts and Mathematics. While CCSS address literacy across the content areas, they do not replace content area standards in other disciplines of study such as foreign languages, sciences, or the arts. Several of the main areas of emphasis in CCSS English/Language Arts literacy standards are aligned with the artistic processes of Responding and Connecting presented in the new arts standards. The Mathematical Practices in CCSS math standards parallel the artistic processes model as well as the creative practices that permeate the new arts standards. Readers interested in delving more deeply into this topic are encouraged to refer to The College Board’s publications that examine and detail commonalities between the new arts standards and CCSS. Will my students be successful in achieving the new standards? The new standards are designed to be achievable when students are provided with a high-quality, sequential, standards-based program of instruction. While effective teaching plays a significant role in student success, so also do important opportunity-to-learn factors such as staffing, funding, facilities, materials and equipment resources, and time and scheduling. How will the new standards inform arts teacher evaluation? State education agencies and local districts determine the basis for teacher evaluation. To prevent standardized tests from narrowing children’s curriculum, arts educators should be encouraged to focus on arts learning, and classroom teachers should integrate the arts in ways that reinforce arts outcomes. In formalized educator teacher evaluation systems, grade-by-grade standards provide an appropriate starting place for identifying appropriate Student Learning Objectives. Because arts standards outline the most important outcomes of arts education, they will be helpful to arts educators as well as their supervisors in designing appropriate arts objectives and measures. Will my state adopt these new standards? States have developed a variety of processes for adopting or adapting or revising arts standards. In some states, the legislature oversees and approves new standards; in others, a state board of education, sometimes appointed by the governor, oversees this process. Just as no two states are alike in terms of their standards adoption process, no two states will be alike in their timelines. Some states follow a strict timeline for updating their current state level arts standards which is set by the state legislature; other states update when funds and time permit. To learn more on what your state is planning, please visit www.seadae.org to identify and contact your state department of education’s arts education consultant, who should be able to provide you with more information regarding your state’s plans and how you can get involved. What kind of professional development is being planned to support teachers seeking to better understand and use the new standards? The professional arts education associations and other NCCAS member organizations are planning and implementing ongoing professional development opportunities that will be delivered – online and in event-based workshops – by NCCAS leadership as well as members of standards writing teams. Contact your professional organization for more details.